Chapter headings and section headings: Preface. Introduction. Physical Features and Processes of Nearshore Environments. Classifying nearshore environments. Effects of waves on deltas. Summary. Hydrodynamics of Waves and Nearshore Currents. Classification of waves. Two-dimensional representation of shoaling waves. Representation of refracting waves in the third dimension. Momentum equations for conservations of energy and momentum. Computer procedures for simulating waves. Nearshore Sediment Transport. Procedures for representing transport by waves. Equations for nearshore transport. WAVE's procedures for calculating transport rates. Summary. Simulating Erosion, Transport, and Deposition. Representation of space and time. Continuity equations for sediment transport. Representing sorting with four grain types. Experiments demonstrating WAVE's procedures for simulating transport. Simulating Longshore Transport on Beaches. El Moreno and Silver Strand beaches. Simulating longshore transport near jetties at Anaheim Bay. Simulating Longshore Transport on Deltas. SEDSIM's representation of flow. Linking WAVE with SEDSIM. Appendices. References. Index. 139 illus., 230 lit. refs. Simulating Nearshore Environments provides computer procedures that realistically represent nearshore processes and supplement or replace trial and error methodology. The procedures simulate transport by waves and fluvial processes on beaches and deltas at various scales. They will aid coastal engineers, oceanographers and sedimentary geologists who focus on both modern and ancient nearshore deposits. How do you simulate nearshore processes using a computer? Can evolving deltaic and coastal environments be simulated realistically by mathematically representing the physical processes that create them? Once the physics and mathematical formulation are described, what are the techniques for transforming them into computer programs? The authors deal with all these aspects and take a "how to" approach in guiding the reader through the development of computer models for simulating sediment transport in coastal environments. 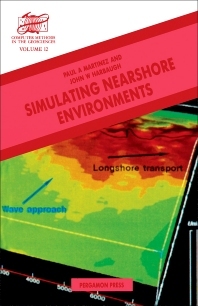 In addition to describing the devised computer programs, the book provides a basis for those wishing to formulate their own mathematical models for simulating nearshore processes. For coastal engineers, oceanographers, geologists, sedimentologists, marine biologists and civil engineers.